The Webster City Dr. wants her to go there as he thinks they might be able to find something more to do for her. Cora called up Sun. she was still there but expected to go any day. I do hope she gets help she surely need it. 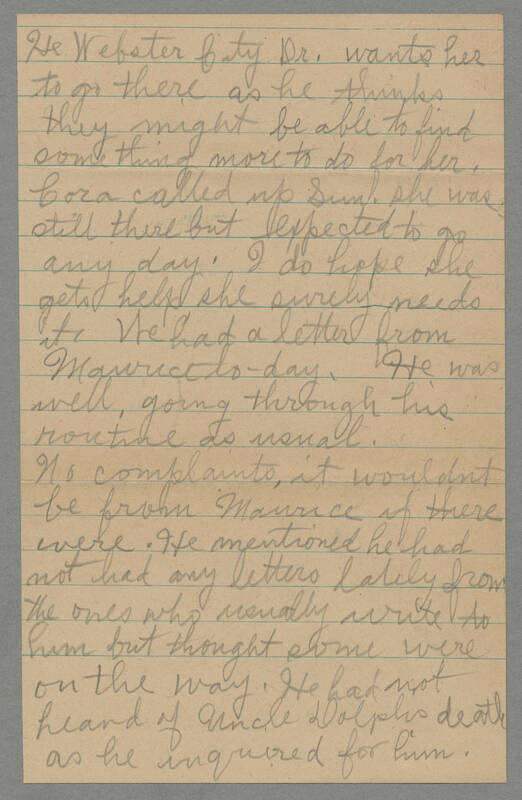 We had a letter from Maurice to-day. He was well, going through his routine as usual. No complaints, it wouldnt be from Maurice if there were. He mentioned he had not had any letters lately from the ones who usually write to him but he though some were on the way. He had not heard of Uncle Dolphs death as he inquired for him.